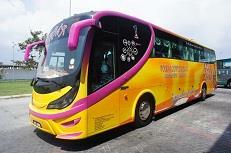 Konsortium Bas Ekspres Melayu (Klang) Sdn Bhd is a fast growing bus company based in Shah Alam and Klang region. Currently the company operating fleet of 15 buses with the brand name of KMK StarCoach Express.The company is operating bus services from Klang Sentral Bus Terminal and Shah Alam Bus Terminal to many cities around Malaysia, including Seremban, Johor Bahru, Masai, Pasir Gudang in the south of Malaysia and Ipoh, Butterworth, Penang, Sungai Petani and Alor Setar in the north of Malaysia. The most famous routes are buses from Shah Alam to Butterworth, buses from Klang/Shah Alam to Johor Bahru and Sungai Petani.By joining BusOnlineTicket.com, Konsortium Bas Ekspres Melayu (Klang) Sdn Bhd can now offer the online booking service for the residents staying in Klang and Shah Alam area.